How The Sharing Economy Is Changing The Places We Work : All Tech Considered The sharing economy is already changing several sectors: housing, transportation, retail. In some cities, it's changing the way we work. As more people start their own enterprises, they're shunning traditional offices and choosing to share space instead. The Sharing Economy: A Shift Away From Ownership? Co-workers at Denver's Galvanize, a tech hub in Colorado's capital. This week, we've been reporting on the sharing economy — a term that describes the couch-surfing, car-sharing and community-garden-growing world where so many people are using their existing talents, space or tools. You'll find the stories on this blog and aggregated at this link, and we would love to hear your questions about the topic. Just email, leave a comment or tweet. The sharing economy is powering a rise of new entrepreneurs who need a different kind of office space. Co-working spaces that foster certain communities, like Galvanize, in Denver, cater to that changing culture of work. When you walk into it — the first thing you'll see is a well-stocked bar. The second is a coffee shop. 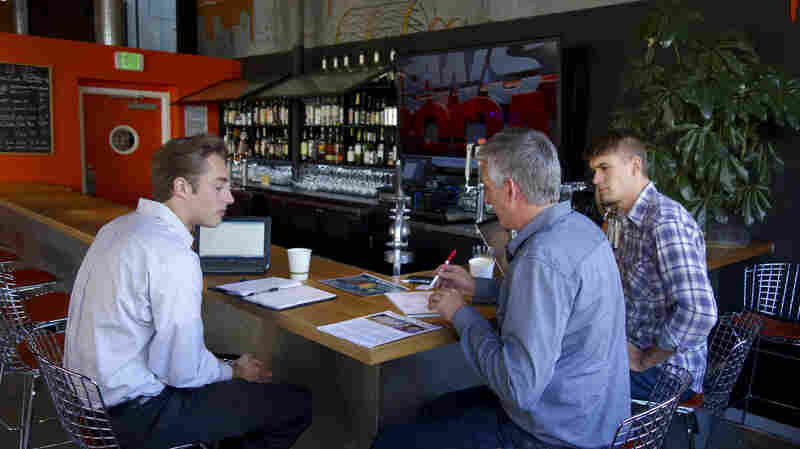 A morning meeting at Galvanize's office bar.
" 'Cause coffee fires entrepreneurship, if you will," says Chris Onan, one of the three co-founders of Galvanize. The 30,000-square-foot space is converted from an old bank note building, and a year after opening it's home to more than 140 tech companies that range from having one person work here occasionally, to teams of 30 that rent semi-permanent suite spaces. The front, where you find the cafe, is open to the public. 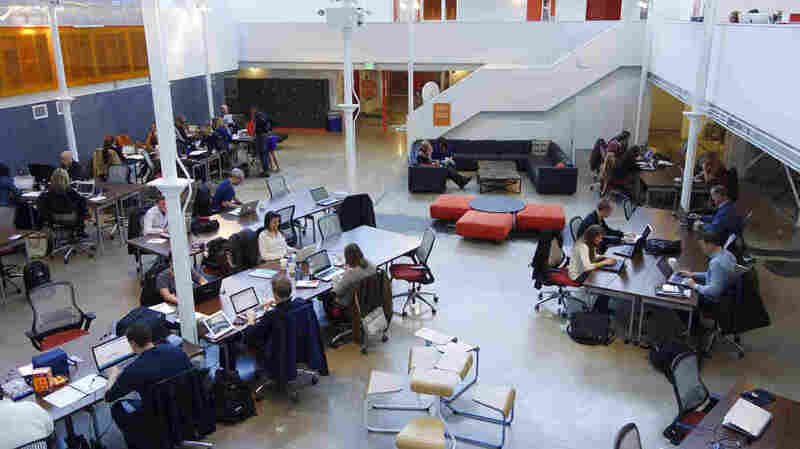 The nerve center of the space is an atrium of open workspace, which costs a few hundred dollars a month for membership. The outer rim of the bullpen is lined with glass-enclosed studios where midstage startups rent space next to one another but don't get tied to long-term leases. "I'm not gonna rent a space for five years. Who knows where I'm gonna be in five years?" says Samantha Holloway, who heads GoSpotCheck, one of the companies who snagged a glass suite. As the sharing (or peer) economy became big, more people shunned traditional offices and started their own enterprises, and those enterprises needed space and resources. That's what happened with Holloway. 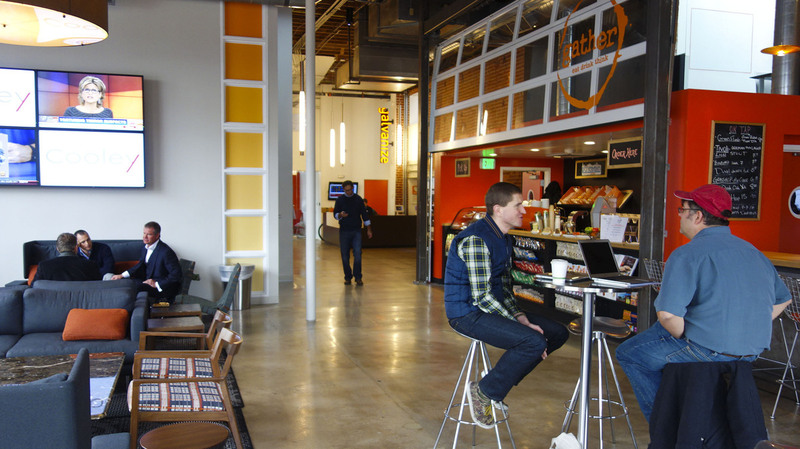 The main atrium of Galvanize allows freelancers to work or come and go as they please, for a monthly membership fee. "We were just a couple of us in a garage beforehand," she says. "We had graduated from my basement to a garage; we were in that garage for about a year. And then we were growing as a team, we were finding the right product market fit, and we needed a better environment to work." This kind of work environment is now cropping up in cities around the world. Galvanize is not exclusively a co-working space, but a hub for tech-specific companies, since the vision was to create a community for entrepreneurs in the same field. It's also a school for designers and developers. It's the brainchild of Jim Deters. "I do think the rise of facilities like this [arose] to support these solo-prenuers that don't just want to work in a coffee shop or hotel lobby, or get tired of sitting at home by themselves in their jammies," Deters says. "They want to come and work in inspiring environments to make connections and be part of a community to share ideas and transfer ideas." Galvanize co-founder Chris Onan holds a cup of Galvanize's signature coffee. It was the ideas for technology platforms that make so much of the peer economy possible. So it's fitting that the people founding technology companies led the way to this newer kind of work style. "I like to talk about the importance of building the connective tissue or the relationships between people in these sort of share-a-beer moment, or share-a-coffee moment, because that's what makes us human, right?" Deters says. "We like to break bread together, we like to socialize together, and work and life are not different for this generation. Work is not just work for these people. It is their life." "These people" — millennials — are the sons and daughters of baby boomers and now number at least 75 million. By many counts, they outnumber boomers. Denise Cheng, a peer economy researcher with the MIT Center for Civic Media, points out a key reason millennials went full bore into the sharing economy: out of necessity. "They actually don't have a lot of the same opportunities because right around the time they were born was when a lot of corporate structures started to change, and those benefits started to go away," Cheng says. "I think that one really big thing about the millennial generation is that we are going to have so many different careers over a lifetime. And that fluidity also translates into what our work structure looks like." 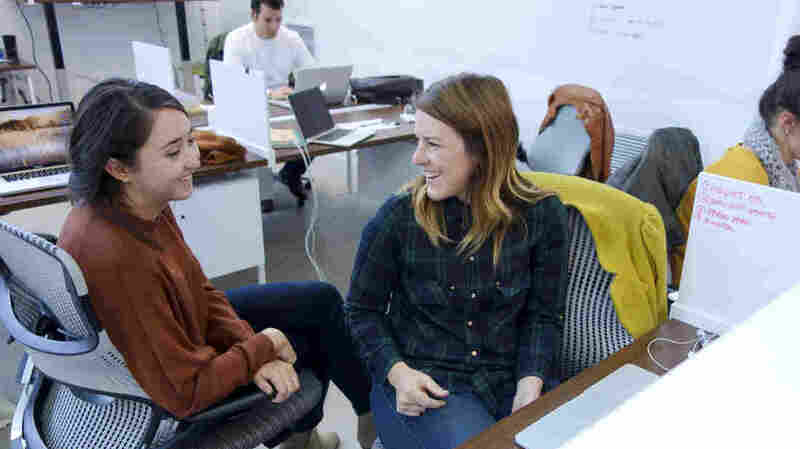 That fluidity is working out well — not just for Galvanize's young tech founders — but for employees of existing and established businesses that work out of the space, which include the car service Uber, file-sharing company Box and online audio company Pandora. 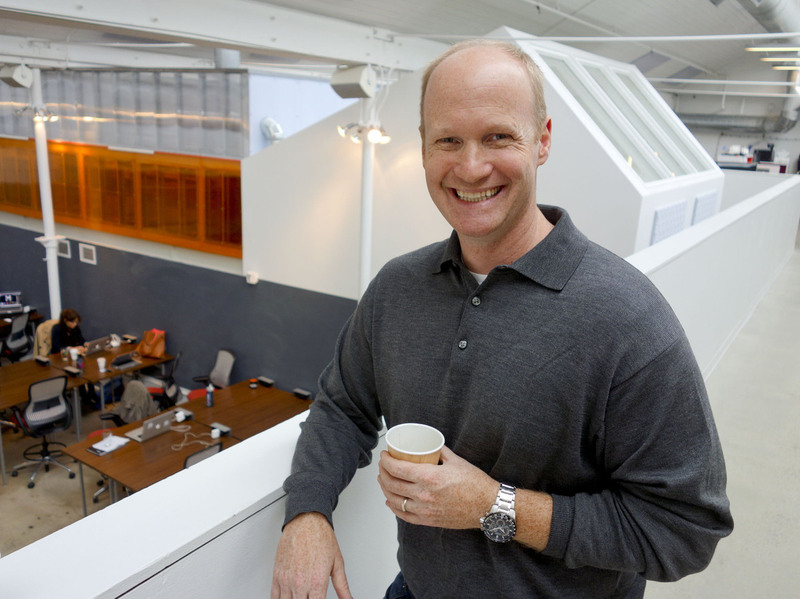 Pandora's small sales team rents desks overlooking Galvanize's floor of freelancers. "It was just two of us; we wanted to be part of something greater, with more a vibe to it," says Pandora's Robin May. The vibe is what the future of work feels like for lots of young entrepreneurs. A place without walls, all kinds of freedom and fueled by coffee and beer. The lobby entrance to Galvanize is a bar and a coffee shop.